11-JUN-2015: Better implementation of the features of Arsil's Customizing Custom Drinks mod when creating new drinks on juice bars. The custom Create New Drink interaction from Arsil's Customizing Custom Drinks mod can now be used on juice bars that have professional bar interactions enabled (The Remove Custom Drink interaction still only appears on professional bars though). 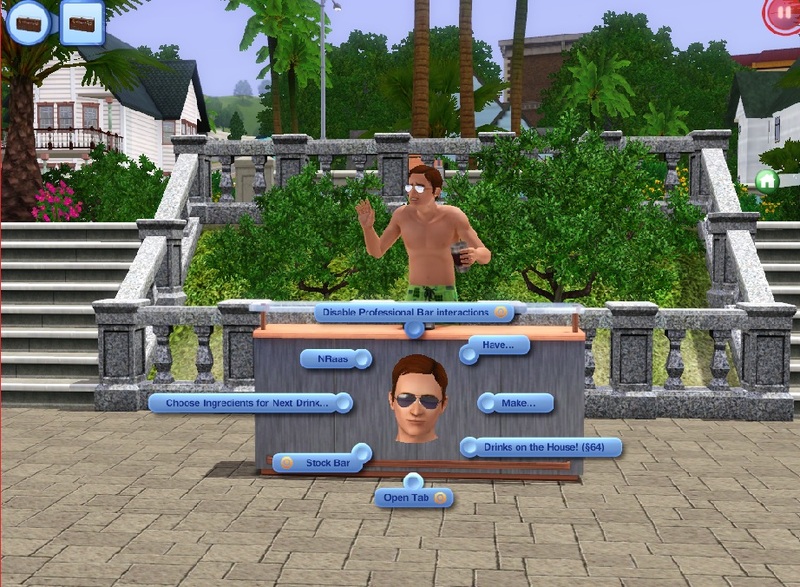 Sims can now practice making drinks on community lots and also on juice bars that do NOT have professional bar interactions enabled, even past the level which they were originally blocked from doing so (NOTE: the animations on a juice bar without professional bar interactions enabled are quite literally off center so if that bothers you then enable the interactions before practicing). 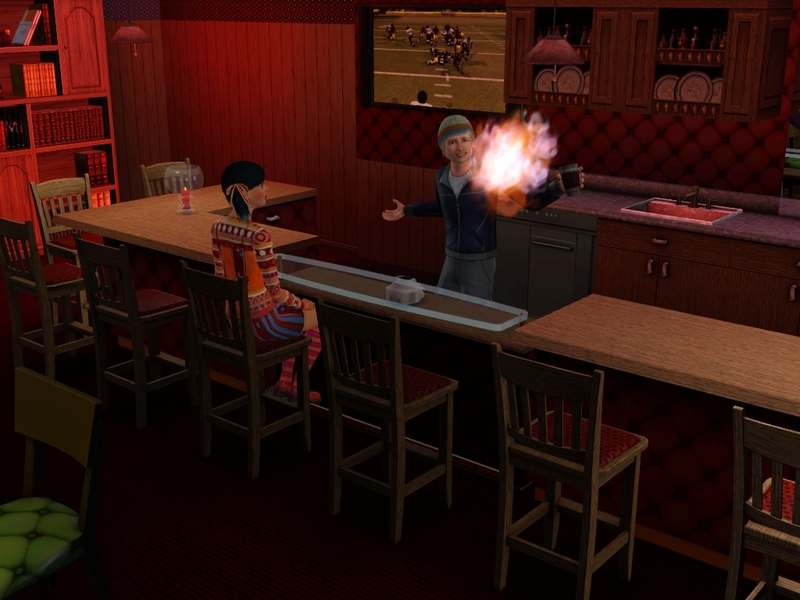 Once either of these are performed, the drinks can be dragged and dropped freely, and your sims can choose to drink them directly from their inventories. Split and arranged the Order Drink interaction by mood drink types (for both professional and juice bars) so you can tell what type a drink is when ordering. 1-SEP-2014: Removed the code automatically toggling professional bar interactions on/off when changing lot types since it turns out to not do anything. 7-AUG-2014: Added a fix for the issue where sims reset when ordering pizza at the bar (both on juice bars and professional bars). 11-JUL-2014: Translations added: Polish (by kociara81i), Italian (by Sim mania). Thanks! 9-JUL-2014: Translations added: Portuguese-BR (by bellakenobi), Spanish (by FlyingAce. Not sure if it was meant for ES or MX so I just used it for both). 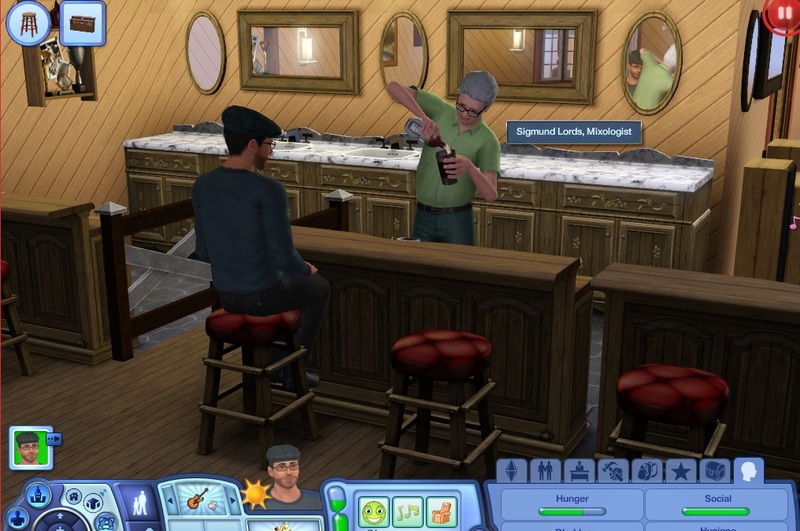 Sims should now properly gain mixology skills when serving drinks (also fixed a routing issue with the interaction) and will need to be at least level 6 to create new drinks again (Can be changed by editing the PracticeMakingNewDrinks_BarProfessional ITUN - NOT included in the mod) Thanks to sydsyrious for pointing these issues out. 4-JUL-2014: Chinese translation added (thanks egureh ) Sims already sitting at the bar should no longer stand up and sit down again to order anymore. Not only can your sims practice their mixology skill and make more than just quick drinks on all bars with this mod, juice bars on community lots can be assigned mixologists, which saves you from having to replace every juice bar with a professional one in all those bar/club/pub wannabe lots every default EA world besides Bridgeport seems to have. * was already available on juice bars but only up to level 3 by default, this restriction is removed with the mod. 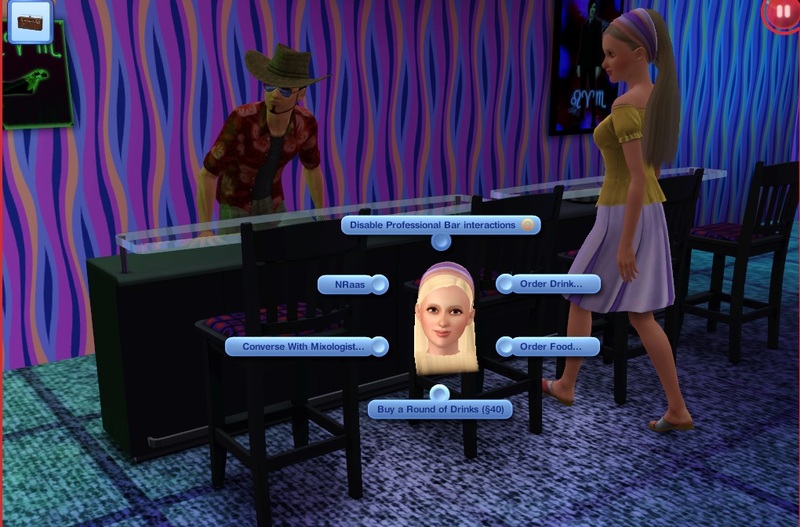 In addition if you have Island Paradise on Resort lots the options to hire/fire a resort bar worker for the bar, set their hours/uniform/ the resort drink quality, and to tend the bar themselves (for sims that own the resort) can also be enabled for juice bars. The option to Enable/Disable Professional Bar interactions is added to all juice bars and lets you enable/disable the above mentioned interactions per juice bar. By default, all juice bars on Residential lots ONLY will have these interactions enabled on them when you first install the mod. The way the mod works enabling the interactions for juice bars on a community lot will cause the game to assign a mixologist to the bar, but I'm guessing not everyone might appreciate this if they had many juice bars on different lots all over their world, so I have them disabled on community lots by default and you can enable them on the bars you want as you see fit. If you only want to use the professional bar interactions on a juice bar on a community lot but don't want a mixologist assigned to it, you will need the NRaas Register mod to disable the assignment after enabling the interactions with this mod. The Order Drink interaction (for both professional and juice bars) is split and arranged by drink type so you can tell what type a drink is when ordering. The interaction to have/make mood drinks on professional bars (as well as juice bars if enabled) which is restricted to residential lots by default can now be used on community lots now as long as the bar is not being tended. Added a custom cheat Bartending enableAll/disableAll (used in the cheats console, requires testingcheatsenbaled true first) which lets you enable/disable the professional bar interactions on ALL juice bars in the world at one go. When enabling interactions on juice bars on community lots the NRaas Register menu (if you use that mod) does not immediately appear on the bar for you to set/remove/disable roles on the bar. Entering Edit Town OR Build/Buy mode on the lot and then back to live mode OR saving and reloading should get them to appear if you need them. If you do find any other glitches/issues (animation related or otherwise) be sure to inform me via the comments. IMPORTANT: Should you wish to uninstall the mod, please disable the pro bar interactions on ALL juice bars in the game before saving, quitting and removing the mod, or you run the risk of the saved game not loading without the mod. Use the Bartending disableAll cheat (requires testingcheatsenabled true first) as a quick and surefire way to do so.